First of all, let me start out by saying how much I love this series. I love the chemistry between Gage and Kiera so much and each mystery reads very quickly. I’ve been binge reading the books since spring break so here we are with the fifth mystery which puts me officially caught up on the series. Before long, Kiera starts to suspect that some of the girls may be hiding a sinister secret. With the killer poised to strike yet again, Kiera and Gage must make haste and unmask the fiend, before their matrimonial bliss comes to an untimely end (summary from Goodreads). 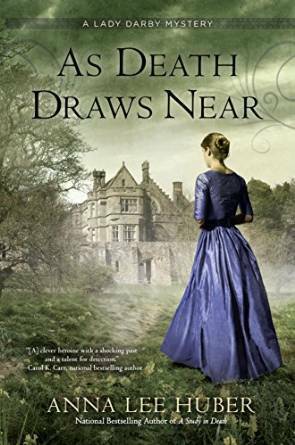 So this one started out promising for me……I liked the whole interrupted honeymoon and the new setting in Ireland. I also likes meeting Marsdale again in this book….he was colorful and interesting in the first book so I was happy to see him making an appearance in this one. But at some point after landing in Ireland, I started to lose interest. As a Catholic myself I was excited about the plot with the nun and a convent etc but something about it never really took hold for me. I think there were too many religious elements that bogged the story down for me. The whole Catholic/Protestant conflict was hard to sort through…..Irish/British and religious history has never really been an interest of mine and add in the whole Ribbon Men part of the story and I was completely lost. It was a lot for me to keep track of and I found myself losing interest in the politics and religion. It made it hard for me to even become invested in the mystery because I felt so lost in it all. As happy as I was to see Marsdale in this book, I started to wonder why he was even there in this book. I felt like his presence was unnecessary and didn’t really add anything to the story for me. However, I wonder if his reintroduction in this book means he will eventually become more important in the overall series? I think the one thing I was most disappointed in was I didn’t feel like Gage and Kiera’s relationship advanced at all. I felt like for a lot of the story they weren’t together. They seemed to be always going in opposite directions and didn’t seem to really be working ‘together’. It was more that they came together to exchange tidbits of information and then went the separate ways. For me, their chemistry makes the series and I was a little let down that they weren’t really ‘working together’ and progressing in their relationship. At the end there was a nice little hint of the same tenderness that I’ve come to expect between the two, but then that was it and the story was over. I just found myself wanting and expecting more of this book. When it comes to a series, it’s rare that every book is a five star rating or as amazing as the first book. Sometimes there are a couple of three or even two star books in the series, but for me that doesn’t necessarily mean that it isn’t wroth the read. When I started the Sookie Stackhouse books, the first 9 were great, but the subsequent ones were just not of the same caliber but that doesn’t mean I didn’t love her as a character or that the whole series was a bust, it just means that some were good and others were GREAT. That’s kid of what’s happening for me in this series. I love the series as a whole but a couple of the books were just ok, however I still love Kiera and Gage and I eagerly await the next book in the series!